These days the internet is full of hilarious cats doing incredibly entertaining things. While many of us may have spent hours following our cats around while filming them on our phone in the vain hope that they’ll do something entertaining or meme-worthy others have realised that the best way to capture a camera shy cats best moments is to do so surreptitiously by installing a cat camera. If you are looking for a simple cat camera that doesn’t dispense treats then skip to our second table of the best budget cat cameras here. Others may have less selfish motives for investing in a cat camera, such as a genuine concern for the welfare of their pet while they are out and about. Whatever your motive we hope that our breakdown of some of the very best cat cameras currently available on the market will be of use and value to you. Who Needs a Cat Camera? To many people cat cameras seem like a bit of an unnecessary purchase however there are many reasons why it could be a very useful purchase. For example if you have a cat which has health problems and you want to be certain that it is managing okay during the day while you are out then a camera is a useful way to put your mind at ease. If you have got kittens a cat camera could also be useful as it will allow you to check what they are getting up to. Anyone who has ever had kittens will tell you it is surprising how much trouble they can cause in just a few hours (or even minutes) left alone! If your cat has a condition or ailment which requires it to have regular tablets then a treat dispenser feature could be very useful as you could hide the tablet inside a treat and dispense the treat remotely at the appropriate time. When choosing a cat camera it is important to ensure that you purchase a camera which fulfills the needs of you and your cat. There are variety of features and functions available on the different cameras we have reviewed below. An iPhone and Android compatible app to view and control the camera through. If you’re looking for a cat camera with as many features and gadgets packed into it as possible then we recommend you check out out reviews of feature filled cameras, alternatively if you would rather just have a simpler camera which does the basics well then check out our budget cat camera reviews. A fully rotating tower camera which also includes a laser function so your can play and interact with your pet. The Camera has a decent 720p resolution, it also has the ability to shoot in 320p if you want to save on bandwidth. However what is really good about this camera is its range of view. With 340 degrees of rotation and 110 degrees of vertical movement combined with it’s wide-angled lens it is one of the better cameras available. If your cat is in the same room as the camera and isn’t hiding behind something then you definitely will be able to see it! The app includes the ability to take still shots and ten second video clips from the camera and save them directly to your phone. The app also allows you to share camera access with friends and family which could be useful if they are pet sitting for you. The Petkit is similar in appearance to some of the larger treat dispensing cameras however it doesn’t dispense treats but instead rotates smoothly on it’s circular base. This base also lights up whenever the camera is active. It is available in both wood effect patterning and rose gold colouring and features a long black strip down the middle where the camera, sensors and laser is housed. The inbuilt laser feature is a nice feature which can be turned on remotely via the app and used to give your cat some exercise. It moves automatically so can’t be manoeuvred around the room manually from the app which is a shame and is one thing which could improve this camera. Again this product also allows you to hear and speak to your pet. By simply pressing the microphone button in the app you can speak through the speaker, any sound that your cat makes will also be caught by the microphone in the camera. Which phones does the PetKit App work on? The Petkit app works on all mainstream operating system including all iPads and iPad mini from the iPad 2 and iPhone 4s upwards. It also works on the following Android devices too; the Galaxy Note2/3,S3,S4,S5,S6/S6 edge,S7/S7 edge, Huawei 3C,4C,4X/5X,4A,6/6 plus,7/7i,P7/P8 OPPO R7/R7 plus,R8,R9/R9s/R9 plus. Perfect for: Cats (or owners!) with separation anxiety. Have tons of fun with your pet all day while you’re at work. As a cat lover myself, I know that the hardest part of a cat owners day is leaving their pet behind. Now you don’t have to ever again. The Furbo Cat Camera keeps you together no matter how far apart you are. Wifi connectivity, Amazon Alexa compatibility, meow detection, a 1080p HD camera—there’s not much to dislike about it. It really shines in how it helps you have fun with your kitten and cure their separation anxiety. The unique treat-throwing feature lets you store up to 100 treats and launch them at your cat all day, and you can even talk to them so they don’t miss you. 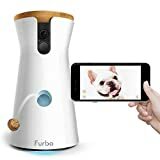 The Furbo doesn’t skimp on quality, with a high quality 1080p camera you get a great HD view or what your cat is up to (the camera quality is almost good enough to use to take pictures of your cat which you could send to Petsies to get a realistic stuffed cat replica made!) and the night vision functionality of the camera works surprisingly well too meaning that even when all the lights are out you will still be able to watch your pet with ease. Although the Furbo, unfortunately, doesn’t include the ability to rotate it does have a very wide angled camera lens which will give you a good 160-degree view of your room, which, when combined with the treat throwing function will quickly bring your cat into view. How Does the Furbo Look? If style is high up on your list of priorities then look no further, the Furbo is a beautifully constructed camera, with soft rounded edges. It’s outer casing is white with a pleasing bamboo lid on top of it, while it may not boast a laser or rotation mechanism it makes up for that with its clean pleasing looks. Measuring 15cm x 12cm x 22.5cm it is by no means the smallest product available however that is necessary to create space for all of those treats! It also weighs 798 grams (and that’s before you fill it with tasty treats!). I don’t watch the Ellen show but apparently the Furbo featured on her show and wowed viewers with it’s ability to feed your pet on command by simply asking Alexa to do it! This is a pretty cool feature which I believe only one other cat camera currently offers. A lot of cat cameras include treat dispensing mechanisms however most of them severely limit the number of treats you can store in the camera, not so the Furbo which allows you to store 100 treats inside it! Enough treats to keep your pet happy for a week if needs be (although we don’t recommend feeding your cat in this way!). Which Phones Does the Furbo App Work On? The Free Furbo app is fully functional on all iOS and Android operating system. The Pawbo, by Acer, combines three features; camera, treat dispenser and laser pointer, all at a very reasonable price. The 720p video camera is, for the most part, a great performer, with clear image quality, however some users report that image quality suffers a bit when the quality of light in your room is poor or there are things such as Christmas lights in the cameras view. One handy feature of this camera is the ability it has to create sounds such as a birds tweet or a cats meow. 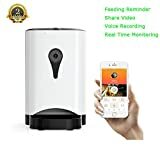 Your pet will quickly come to associate the noise with a treat being dispensed so this can be used to summon your pet to the camera whenever you want to see them. The camera also has a functionality which allows you to store video recordings of your cat directly on Dropbox (it is worth noting that if you do not have a Dropbox account it is not possible to save video at the moment) as well as the ability to take pictures from the camera and store them on your phone. One slight drawback to this camera is that you cannot adjust the view to look around the room, this can be particularly frustrating when you dispense treats as the treats are not fired out very far so if your cat is eating the treat below the camera you may not be able to see it, so you must ensure that you get the positioning of the camera perfect when you set it up. Measuring 11.2cm wide x 11.2 cm deep and 20 cm tall it is sleek and inconspicuous when inactive. Made from white plastic it is also very lightweight weighing only 0.56kg (when not filled with treats), it can however feel a bit flimsy but providing you place it somewhere secure this shouldn’t be a problem. The power cord is roughly 1.5 meters which does limit it’s maneuverability somewhat so you may require an extension lead to put it exactly where you want it. It also doesn’t feature any switch to turn it on or off but rather is immediately turned on as soon as it is plugged in. The treat dispenser is one area which could definitely be improved. The limited width and depth of the Pawbo means that the treat carousel is very small only allowing for the storage or nine small treats, this means that regular refills are required. The carousel also feels quite flimsy and lightweight so make sure that care is taken when loading it. This is a great feature which cats seem to really enjoy. The Pawbo app allows you to manually move the laser pointer about yourself using your phone so that you can play with your cat without even being there, there is also an automatic function which will move the laser pointer for your cat too. Which Phones Does the Pawbo App Work On? The Pawbo app will work on all iPhones and iPads which have iOS 6 or above installed, it also works on any phone or tablet device which uses android 4 or above. The Petcube Bites is a market-leading innovator with two-way audio allowing you to talk to your pet as well as Alexa connectivity putting it ahead of many of it’s nearest rivals. The Petcube has a HD 1080p camera which has a wide-angled 138-degree lens allowing you to watch what your cat (or dog) gets up to in great clarity via their app. The app also allows you to zoom in on your pet which can be useful if they are the far side of the room. The camera also features impressive night-vision functionality which means you can even see your pet fairly clearly even when there is minimal light in the room. The Petcube is a sleek and smart looking device with a flat back so that it can be fitted to a wall if required. It measures at 8.6cm deep x 23.8cm wide x 42.4cm tall and weighs 2.59kg (when not filled with treats). As is standard for some of the more high end pet cameras the Petcube has a treat dispenser function. The treat dispenser allows you to specify how many treats to dispense and how far to shoot them. It also allows you to schedule timed intervals for regular snacks. One thing to be aware of with the Petcube is that it allows two different options for treat sizes, so you must ensure that you select the correct option for your treat size otherwise it may not work or may unintentionally feed your cat multiple treats rather than just one. One of the many great features of the Petcube is its Alexa functionality, once the Petcube has been setup with Alexa you can say “Alexa, give the cat a treat” and your cat will immediately be rewarded with a tasty snack with minimal effort from you! The Petcube’s motion and sound detection features allow you to setup alerts when movement or sound is detected, this is also and handy feature if you also want to use it as a security camera. Which Phones is the Petcube App Compatible With? The Petcube app is compatible with all mainstream phones. Including all iPhone and iPad devices which have iOS 8.4 or higher installed. It is also compatible with all Android devices which have the Android 4.3 (or above) operating system installed. Okay so this is arguably a pet feeder more than it is a camera however it deserves its place in our top ten because for some people a camera that also feeds their cat a full meal is far better than a device that just feeds them the odd tiny snack every so often! Admittedly the camera isn’t the headline feature on this product (that’s the feeder), so you may expect the camera quality to be poor.However while it’s by no means the market leader in terms of camera quality it does put up a good fight with a wide angled lens which allows for 130 degrees of coverage (there is no pan or tilt feature though) and a 720p camera the image quality is crystal clear in good light. Automatic pet feeders can often be pretty ugly behemoths, some of them have clear panels so you can see what level the food is at, while this is practical it is also ugly! Conversely the Maxmer is neatly packaged in stylish white with a well designed camera lens on the front. Measuring 24cm deep (from the back to the front of the bowl) x 16cm wide x 38 cm tall it looks more like a tiny little boiler unit than it does a messy feeder. Admittedly it is significantly bigger than most cat cameras, weighing 2.78kg (and that’s before you’ve filled it with cat food). The automatic cat feeder is the stand out feature on this camera and this is the only camera we have reviewed which does include a feeder. The feeder allows you to specify exactly when to feed your cat and how much to feed them. If your cat is overweight you can ensure that they are getting exactly the right amount of food as specified by your vet to perfectly manage your cats health. You can also manually feed your pet via the app and watch them as they eat through the camera if you wish! With a huge 4.5 liter capacity, it wont need filling up too often. It allows you to serve your cat up to 4 meals a day and a meal will consist of between 1-10 portions (depending on how you set it), each portion is 100 grams of food. be aware that wet food cannot be used in this device – it will ruin it! The cat feeder function is very handy if you know you may have to leave the house unexpectedly for a few days for example if you’re awaiting a baby. One of the useful features of this camera is that, as well as having two way audio which allows you to communicate directly with your cat through the app it also allows you to record a message onto your feeder so that when food is dispensed your cat will be alerted by your own voice without you having to login to the app to call them over. Which Phones Does The Maxmer App Work On? The Maxmer app is compatible with all mainstream devices running iOS and the Android operating systems. If you aren’t overly concerned about your cat having lasers and flying treats projecting out of your cat camera then you may be interested in a simpler model. The Motorola scout is an RSPCA approved cat (and dog) camera which combines 300 degree views of your room with motion sensor triggered video recording capabilities (however this function does require a subscription). The Motorola Scout has a 720p camera which while not the highest spec you can get is very decent with great image quality providing there is a reasonable level of light. It does have an infrared night vision mode though the footage in this mode is a bit grainy. The stand out feature of this camera is its ability to swivel 300 degrees as well as tilt up and down allowing you to keep the camera on your pet regardless of whether or not they decide to stand directly in front of your camera. Some of the treat dispensing cameras only give a very limited view range so if your cat likes to make itself at home on the top of your dresser or in some place where you wouldn’t typically point a camera then this camera is the ideal solution as, with a bit of swiveling and zooming (it also has a digital zoom feature), you will eventually be able to locate your cat (providing they are contained in the same room as the camera!). The camera is smart in pearl black and silver, and also quite small measuring only 10.5cm deep, 16cm wide and 23.3cm tall and weighing 0.5kg. It can sit unnoticed alongside your TV, on your dresser or wherever else you choose to put it. While it doesn’t have a treat dispensing function it does have a number of other features which really add value to this camera for any attentive cat owner. Inbuilt sensors allows the Motorola Scout to send you alerts if room temperature falls above or below levels which you can preset, so you can be certain that your pet is comfortable and isn’t getting stressed due to being overly hot or cold. This is almost a standard feature now for most cat cameras, the Motorola Scout allows you to hear what your pet is doing or saying and you can talk to your pet through your phone’s microphone to reassure them if they appear concerned or stressed. Which Phones Does the Motorola Scout Work On? The app is compatible with any iPhone or iPad device which is running iOS 7.1 or above (this means that anything from the iPhone 4 and iPad 2 will work with it without any issues). It is also compatible with any Android phone which is running the Jelly Bean operating system or above. You can have as many phones connected to the camera as you want however you can only have one viewer at once, this probably is because when you are logged into the app you can control the movement of the camera and obviously only one person at once can control the camera’s movement. The Sotion Super is a good multi purpose camera which is designed specifically for indoor use and thanks to its tilt, zoom and swivel functionality is a great choice for keeping your eyes on your cat. The Camera runs in 960p which delivers a high quality image direct to your phone through the Zeborah App. The App actually supports up to 4 cameras at once so if your cat roams about your house while you are out you could be 4 cameras and strategically place them around your home so that you see exactly what he or she is up to. The camera turns 355 degrees so you could even place it in the centre of a room, for example on a coffee table and get you would be able to view all of the room. It can also tilt 110 degrees up and down. 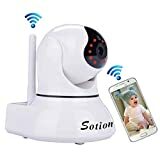 Available in either black or white, the Sotion Super HD does look a bit more like a baby monitoring camera than other cameras we have reviewed. This is thanks to its soft round edges and child friendly design with no small parts. It measures 13cm deep x 13cm wide x 19cm tall and weighs 581 grams. The Sotion has a night vision feature which will allow you to see what your pet is up to in the dark. This feature doesn’t employ any questionably useful technology but rather simply uses LEDs which will turn on when you access the app and will allow you to see clearly up to ten metres in front of your camera, however the night vision mode only shows images in black and white. The Sotion has particularly good quality speakers and microphones (probably because the target market for this product is parents using it as a baby monitor so sound quality is of more value to them) which allows you to communicate with your cat and hear what they are saying as well as talk back to them. The Sotion is operated through their Zeborah App which can is compatible with all mainstream Android and iPhone devices. The Logitech Circle 2 is advertised primarily as a security camera however it also serves very well as a cat camera. This camera is very clear at 1080p and even in low light the image quality is exceptionally good thanks to its inbuilt night vision LEDs which allow you to have a clear view of what is going on even if light levels are very low. The camera doesn’t have swivel functionality however the very wide angled lens provides a 180 degree view of your room. One of the great features of this camera is the day brief function, this function summarises all the action that the camera has caught that day into one 30 second clip so you can know exactly what your cat has been up to without having to have your eyes glued to the app all day. A grey bubble indicates a low activity event. A blue bubble indicates a high activity event, such as your cat running across the room. The Circle 2 is, unsurprisingly, circular, with white casing and a black front panel which houses the camera. It is available in both wired and wireless versions (this can last up to 3 months on one charge!). On both of these versions the camera element is detachable and can be reattached to different their different casing options including the window mount which allows you to stick the camera to the window if you want to keep your eye on comings and going outside your house. Unfortunately in order to take advantage of the more high end abilities of the Circle 2 you have to pay a monthly subscription. For example to get the motion zone system which allows you to draw a zone on your camera’s field of view which will trigger an alert if there is any movement in that particular area you must pay the subscription fee. The same is also true for their person detection feature. Which Phones does the Circle 2 App Work on? The Circle 2 app is compatible with all iPhone devices which are running iOS 8.1 or newer and all Android devices running Android 4.4 or newer. Perfect for: Owners who want a perfect view of their cat but are on a budget. The TP Links camera gets the job done with 720p HD imaging combined with automatic night vision, it is both the perfect security and cat watching camera! The camera also has something called H.264 compression built into it, this is an advanced method of video coding which significantly reduces the amount of data required to view a live stream on your phone. For many pet camera users poor connectivity is a big sticking point with some cameras, with some struggling to work over a 4G connection. The H.264 compression will ensure that even over poor internet connections you are still able to view a seamless live video stream! If your cat is this cute a camera is essential to prevent you missing any cute moments! 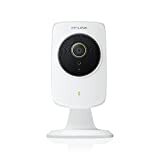 The Tp-Link is a very clean simple looking camera with, pure brilliant white casing which would look at home in a stylish modern kitchen or a minimalist lounge. It is also very diminutive compared to other cameras, measuring 7.6cm x 6.9cm x 13.7 cm and weighing only 299 grams. The TP Link has sensors which detect any movements or noise in the immediate vicinity of the camera, it will then immediately send an alert to your phone via the app. This can be very useful for cat owners who’s cats only make rare and fleeting appearances as you wont waste time and battery life staring at an empty room through your phone but can rather open the app when you know your cat is there. Which Phones is the TP Link App Compatible With? As you would expect the TP Link is compatible with iOS and Android devices. The Yatwin IP camera is competitively priced and packed with plenty of great features without being overly complex. 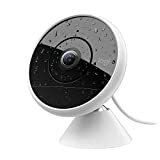 Available in both 720p and 1080p this camera can pan and tilt and also features a night vision mode which uses an array of 12 infrared LEDs in the camera head, these allow you to see clearly up to 10 meters. The Yatwin IP has the look of a professional security camera, available in black it measures 12 cm x 10 cm x 10 cm and weighs just 299 grams. One thing that the Yatwin IP does do that other pet cameras don’t is its auto cruise function whereby it will scan your room with 355 degrees of horizontal rotation and 80 degrees of vertical rotation automatically, this takes the leg work out of looking for your pet! It also allows you to preset up to five different bookmark positions. These can be set so that the camera immediately pans to a common place in the room where you know your cat likes to sit. Which Phones Does the App Work On? The EyeCloud app is compatible with all devices running iOS and Android and it can also be run on a PC too. I know you’ve got the petkit down as the best on ere but i have the motorola one and have no complaints if anyones wondering. Got it on after 5 mins out of the box, videos dead clear and it was a bit cheaper than the others.Just in case someone wanted one that had been a bit more tried an tested and worried about gimmicky ones, got it off amazon for £50 i think. Thanks Bob, glad you like the Motorola, it is a great cat camera and is a great budget option!